The spirit of the past still lives in Fredericksburg, Virginia. George Washington's footsteps seem to echo on the paths and streets of his hometown. 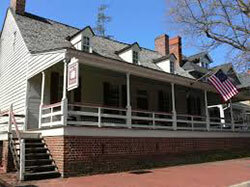 The voices of Thomas Jefferson and other colonial leaders seem to resound through the Rising Sun Tavern. However, many residents and visitors to Fredericksburg have been touched by the city's historic spirit in an extraordinary way. These people claim to have seen and heard the ghostly apparitions who haunt many homes and historic attractions in the city. From an Indian princess to colonial gentlemen and Civil War soldiers, the tales of Fredericksburg's ghosts have survived many years and even more skeptics. Whether you are a believer in the supernatural or not, we hope these ghost stories will make your visit a haunting experience. Chatham was built in 1771 by William Fitzhugh and named after his classmate, Sir William Pitt, Earl of Chatham. 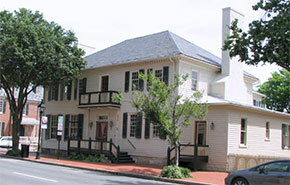 The Georgian mansion became noted for its owner's hospitality during colonial times but played an even more significant role during the Civil War when it served as a Union headquarters. Walt Whitman and Clara Barton nursed the Union wounded there (Historic Tour Stop 27). High on a bluff overlooking the Rappahannock River and the City of Fredericksburg stands Chatham. The mansion has hosted many important people, including George Washington, Abraham Lincoln, and the Marquis de Lafayette. The spectral apparition haunting the estate is none of these illustrious figures, however. The ghost of Chatham is an English girl who returns in memory of a lost love. Dressed all in white, she walks upon her favorite path at the estate in fulfillment of a deathbed vow. She was brought to Chatham by her father, who wished to sever the young woman's romance with an English drysalter. Despite the enjoyable social life of the Virginia estate, the girl pined for her lover. The young drysalter followed her to America, however, and the lovers secretly planned their elopement. Finally the chosen night arrived. The young man silently moored a boat on the Rappahannock and cautiously placed a ladder against his love's window. But instead of climbing down into the arms of her beloved, the young woman found herself enveloped by General George Washington. A guest at Chatham at the time, the general was informed of the elopement plans by a servant. Washington had the drysalter arrested on that fateful night and returned the girl to her father's custody. Taken back to England by her father, the girl ultimately married someone of a more suitable social standing. But she never forgot her true love or the events at Chatham and vowed to walk her favorite path on the anniversary of her death. Several visitors and residents of Chatham have watched the English woman as she makes her anniversary journey on the path now known as Ghost Walk. Always seen between noon and midnight, the lady in white has visited Chatham once every seven years since her death on June 21, 1790. 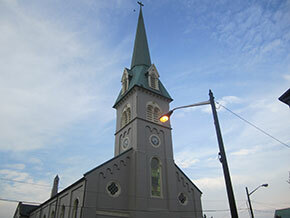 Miss McCarty ascended the stairs to the choir loft where a single lamp was burning. Glancing down into the church vestibule, Miss McCarty was astonished to see a lady in white, her face covered by a veil, kneeling at the altar. The mysterious woman rose from her prayers, turned and looked at Miss McCarty. Beneath the veil, Miss McCarty saw the woman's sad and troubled face. But just as Miss McCarty was about to call to her, the lady in white disappeared into the air. Her identity remains a secret, for she was never seen again. Perhaps she was once among the church's parishioners, as were many Fredericksburg residents. Possibly she came to pray for final rest for a fellow ghost, Col. Fielding Lewis. The Thornton family was among the earliest 18th-century settlers on the falls of the Rappahannock, and their first home was called "The Falls." Later, a more elegant house was built and called by Francis Thornton "Fall Hill." The home is privately owned and is not open to the public. She returns in search of the children she once cared for in life. She is old and dark with long braids, and she loves to play with the ghostly spirit of her favorite Thornton child. She is Katina, the Sioux Indian princess who haunts the estate of Fall Hill. Captured in the late 17th century, Katina was given to Virginia Governor Alexander Spotswood, who willed his treasured servant to the Thornton family of Fall Hill. There she delighted in caring for three generations of Thornton children until her death in 1777. She was buried beneath six giant oak trees on the estate, but Katina's care for the Thornton estate and its inhabitants has not ceased. Even in death, she returns to happily wander among Fall Hill's rooms. Several years ago, two boys sleeping in the old nursery awoke to see a woman in long black braids appear in the room. After gazing at them a moment, the woman disappeared through the wall at the head of the bed. Years later, the nursery was remodeled and the old door that Katina would have used to enter the nursery was discovered at the spot where the ghostly apparition had disappeared into the wall. The Indian princess has also been seen playing in the nursery with Francis Thornton, II, her favorite child, and the only boy in the Fall Hill home. A woman visitor was resting in the room, when the door opened to reveal a boy in knee breeches and a periwig, cavorting with his Indian nurse. The woman watched them for a few moments. Suddenly the two visitors disappeared before her eyes. Many other residents and visitors to Fall Hill have witnessed Katina's appearance over the years, but all who have seen her agree that she is a kind and loving spirit who need not be feared. Built by Charles Yates around 1772, this Georgian mansion is known as The Chimneys. A Scottish immigrant, John Glassell, later owned The Chimneys and operated a prosperous tobacco export business near his home until the American Revolution. Because of his Loyalist sentiments, he then deeded the property to his brother and returned to his native Scotland. Since, the home has been owned and inhabited by many families, and was the childhood home of Nell Herndon, wife of President Chester A. Arthur. Empty chairs rocking, china crashing to the floor, doors mysteriously opening and closing, and the sound of heavy footsteps. All of these ghostly incidents have occurred at The Chimneys through the years. Yet the ghost remains unidentified. In fact, more than one spiritual visitor seems to haunt this home. A music lover must be among the group, however, for it chose to visit during a young girl's musical performance. Alone in the house, the girl was softly singing and playing the piano when she heard the front door open. Footsteps resounded across the hall and into the room. Then the girl felt someone sit down beside her on the piano bench and touch her on the shoulder. The girl watched and and listened astonishedly, for no one was to be seen during the entire episode. Another ghostly visit occurred some time later, but this spirit made a visible appearance. Late one evening, a mother went to check on her young son as he slept. Entering his room, she was surprised to see two young boys sleeping in his room. Someone must have come to spend the night without her knowledge, she thought, although she did not recognize the child. In response to questioning the next morning, her son declared he had slept alone that night, and no signs of the ghostly overnight guest could be found in the boy's room. 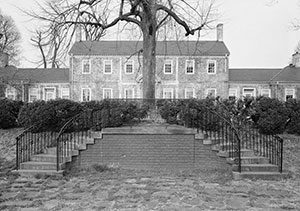 This 18th-century stone mansion survived more than a century of American change and turmoil until it was burned accidentally by Confederate forces during the Civil War. It was built in 1749 by Mann Page, a delegate to the House of Burgesses. The Mannsfield property adjoins the Fredericksburg Country Club, which is not open to the public. "The South Will Rise Again," is a familiar saying. But for the Confederate soldiers who haunt Mannsfield, the South never died. During the Civil War, Mannsfield was occupied by both Union and Confederate forces. The estate served as hospital and headquarters for both armies at different times. But it is the ghostly men in gray who return to haunt Mannsfield. Several nearby residents have sighted the apparitions of the Confederate soldiers as they congregate beneath the estate's large trees. The greatest number of ghostly visits occurred, however, while a clairvoyant woman was living in a nearby home. Regularly, the woman saw the uniformed men as they stood guard, tended to their horses, or cared for wounded soldiers. Perhaps these spectral Confederates who still haunt Mannsfield are awaiting the resurrection of the South. Although its days of challenging and lively political discussions and games of cards and chess over pints of ale are past, the Rising Sun Tavern is still a lively historic attraction and its ghostly inhabitant maintains the spirit of cheer and mischief that once thrived at the tavern. For instance, one tavern guide found that the ghost delighted in unplugging the lights in an upstairs room. Tired of having to replug the cords, she finally cried, "Come on now, stop it!" As she turned to leave the room, the guide suddenly felt herself slipping to the floor as the tavern ghost pulled the rug out from under her. The lights remained plugged in the rest of the day, however. Another hostess was coming down the stairs early one morning when she felt something tugging at the hem of her dress. She looked to see if her colonial gown was caught on something, but found nothing amiss. As she tried to proceed down the steps, however, she felt herself held tightly in place. Long a believer that the tavern's ghost was its last owner, John Frazier, she exclaimed, "All right, John, let go!" Immediately she felt herself freed as the ghost let go of her dress hem. Evidently, the ghost is a playful apparition, for he delights in pulling the mob caps from the tavern hostesses' heads. He also moves objects, such as candles, from their regular storage places. The tavern ghost may also be filled with the Christmas spirit since he delights in pulling his pranks during the holiday season. Federal Hill was built in 1792 by Robert Brooke, an 18th-century Virginia governor. Brooke named the estate Federal Hill, after the Federalist Party, which he helped found. The home is privately owned and is not open to the public. 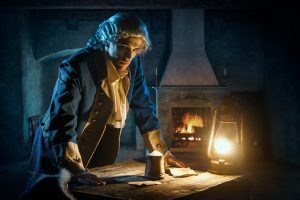 Possibly Fredericksburg's most charming ghost is Governor Alexander Spotswood, a colonial statesman and leader of the Knights of the Golden Horseshoe. No rattler of chains or shrieker of moans and groans, Spotswood visits Federal Hill to mix apple toddies and egg nogs, and occasionally indulges in a nip or two. Attired in the pink coat of a colonial huntsman, he has been spotted eagerly bounding up the front steps of Federal Hill. But Governor Spotswood usually appears standing by the dining room sideboard, busily mixing his favorite concoction. He is even said to have raised a toast to his own portrait. One might say Spotswood is a ghostly spirit full of spirits. Check out L.B. Taylor's series of books which focus on supernatural events around the state of Virginia, and a book list on Virginia Ghosts. For group tour reservations, contact: Tour Coordinator, Fredericksburg Visitor Center, 706 Caroline St., Fredericksburg, VA 22401, (540) 373-1776.